After reading the first volume in Vidar Sundstøl’s Minnesota Trilogy (review here) I was left with the feeling that the story wasn’t done, which will rarely get reviewed in a positive light from me. I feel a book should stand alone as a book, with beginning, middle, and end. But if the first book didn’t have a conclusion, this second volume, Only the Dead, lacks both a beginning and an end. Lance Hansen is a U.S. Forest Service officer. Recently (book one) he discovered a grisly murder of a Norwegian tourist and though someone is being held responsible for the crime, Lance can’t shake the feeling that his brother, Andy Hansen, may have had something to do with it (or at the very least knows more than he’s telling). Lance has already withheld this feeling of his from investigators, but he still wants to know the truth, but he struggles with how to go about doing so. When the two go on a hunting trip together, Lance both longs to confront his brother and fears what such a confrontation may bring. He finds that he is hunting both deer, and his brother, as he stalks through the woods and sights his brother through his rifle’s telescope. But there’s also an ancient story being told here. One that is 100 years old, and may also have a connection to this modern murder, but what that connection is remains unknown and we only experience the wilderness through someone else’s eyes … or is it through Lance, who is remembering someone else’s memories? I think that I know what Sundstøl is doing and what he’s getting at, and I’m willing to be a patient reader and let it develop at its own speed. But it doesn’t develop. Not in this book. This book spends its entire 150 pages with Lance agonizing over a confrontation with his brother or telling us how cold it is. I truly felt that the last third of the book was the narrator (who may not have been Lance at this point), agonizing over the cold. Over and over. Perhaps it’s because I live in Minnesota and I get it. Perhaps it’s because, as I was finishing the book and getting ready to write this review (mid January), the temperature in my back yard is -12°F. But whatever the reason, I felt that this went on much too long. It didn’t define the character. It didn’t further the story. And it only takes once, maybe twice, to establish a general time and location. This book doesn’t have a beginning (for a beginning you must read book one), and it most certainly doesn’t have an ending, and the middle actual serves to confuse the reader more than clear things up. This is most certainly the middle portion of a longer story. That’s fine. But please don’t serve this to me as book. It doesn’t matter how you bind it, this is not two books as part of a larger story. This is two portions of one story, still not complete. Do I want to read book three? Yes, but only to finally have some sort of closure to this story (I hope). Looking for a good book? 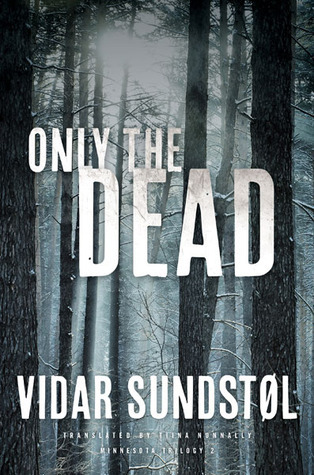 Only the Dead, by Vidar Sundstøl, continues the Minnesota Trilogy story, but far from making things clearer, actually confuses the reader. I can’t recommend this, as a book, and so far I’m not sure it’s even worth it as part of the trilogy. Book three will certainly be the deciding factor.